This image was taken by the SMM Coronagraph and shows a large mass ejection over the east limb of the sun. 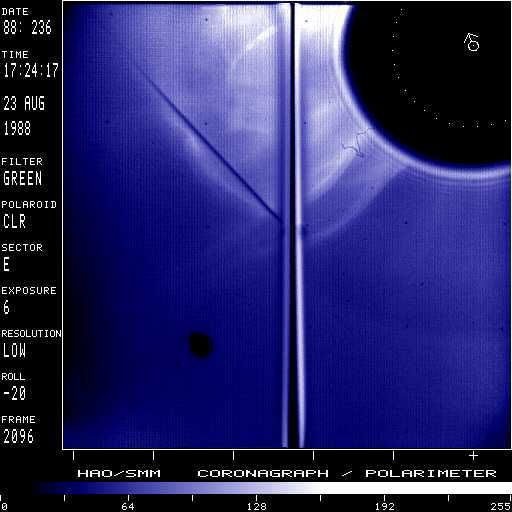 This was the third of three coronal mass ejections recorded at the east limb on August 23, 1988 by SMM. Solar north is toward the upper left as indicated by the arrow drawn into the occulting disk; the dotted circle marks the solar photosphere. Structured jet (prominence?) at 118 degrees, visible from 08:53 to 10:35. Jet is followed by a broad, faint loop/cavity from 09:09 until 09:42. Additional structured (prominence?) material is visible at 09:17 at 118 degrees and at 128 degrees at 09:42. Northern edge of broad, faint loop is superposed on streamer. Streamer is unaffected. Thin, irregular loop/cavity with possible core at northern part of loop. Deflections. Bright, flattened loop/cavity with structured, interior (prominence) loop/cavity in streamer. Streamer is blown out. Big deflections. Blob of material is ejected in streamer south of event from 100 to 132 degrees from 20:32 until 21:24 UT. Concave-outward shaped material is visible at 100 degrees at 00:32 UT and moves outward and southward until ~02:15 UT.